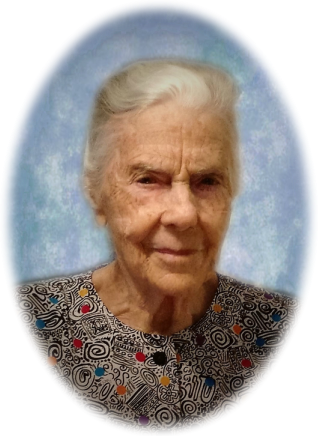 Mae Moore, age 96, formerly of Garrett, KY, widow of Artis Moore, passed away Sunday, July 15, 2018 at the Hospice of Butler and Warren Counties, Middletown, OH. She was born June 10, 1922 in Dry Creek, Kentucky, a daughter of the late Vance and Mary Hall. She was a member of the Old Regular Baptist Church and a homemaker. Mae is survived by several nieces and nephews. In addition to her husband and parents she was preceded in death by one brother; Dow Hall and three sisters; Susie Hall Retherford, Ida Hunter and Clearcy Adkins. Funeral service will be conducted Saturday, July 21, 2018 at 12 noon in the Hall Funeral Home Chapel, Martin, KY, with Curtie Hall and other Old Regular Baptist Ministers officiating. Burial will follow in the Davidson Memorial Gardens, Ivel, KY, visitation is from 5 until 9 p.m. Friday and 10 a.m. until time of service Saturday at the funeral home, under the kind and professional care of the Hall Funeral Home, Martin, Kentucky.